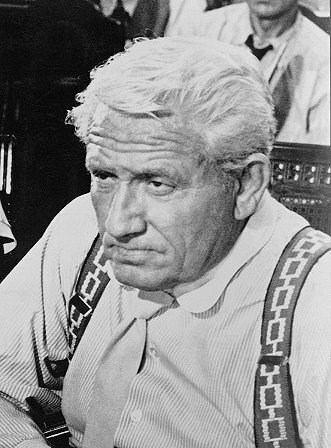 Henry Drummond is one of the two main characters in the stage play, Inherit The Wind. Drummond is the fictional version of the real lawyer Clarence Darrow. 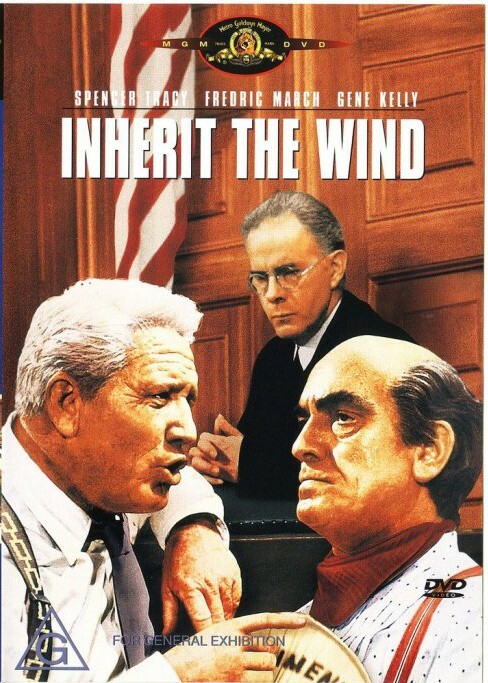 Inherit The Wind is the dramatized version of the Scopes “Monkey Trial” that took place in 1925. Darrow/Drummond represented a teacher who was fired for teaching evolution in a public school, which was against the law at the time. Drummond starts out as a considered “villain” of the play – being an atheist/agnostic in a predominantly Christian town, fighting for the right to teach evolution, which was referred to by the citizens as “eviloution.” As he shows how down-to-earth he is, he gains the respect of the town and manages to restore the dignity of the teacher who was humiliated and practically tortured at the beginning of the show. Drummond is also very intellectual. He raises deep questions about the Bible and religion in general, many of which have inspired discussions all over the world about what faith means to many people. How did I discover Drummond? I first came to know Drummond in my freshman year of high school, when my english class read Inherit The Wind during class, with each student getting a different part to read. My teacher thought I would be best as Drummond, and thus in reading the part, my inspiration began. How does Drummond inspire me? This quote has stuck with me ever since I first read it to my classmates over a decade ago. Drummond uses this verse to demonstrate why the characters that turned against their own families and friends suffered great losses during the show. Lawrence and Lee (the play’s authors) used Proverb 11:29 in two other instances in the play. In Act II, Scene 1, Reverend Brown gives a fire-and-brimstone sermon at a prayer meeting held on the courthouse lawn. He becomes overzealous in condemning Cates, and when his daughter asks him to stop, he asks for retribution for her also. Brady intervenes because he is concerned he will lose the support of the townspeople. The advice he gives to Reverend Brown is the wisdom of Solomon in the Book of Proverbs, “He that troubleth his own house . . . shall inherit the wind.” Brown has caused trouble in his own house by condemning his daughter and will, ultimately, “inherit the wind,” when Rachel leaves him. The second time Lawrence and Lee use Proverb 11:29 is in Act III. Hornbeck comments that when Brady recited Proverb 11:29 to Reverend Brown, he was in fact ” . . . delivering his own obituary.” Brady “inherited the wind”: He died as a result of his actions. He made a mistake believing he was infallible. Drummond was my first exposure to thoughts and beliefs outside of the Christian Church. He was the first person/character I met that was not-Christian identified, and he had me wondering what it was like. While I was never abused in my original church, my first pastor was very aggressive and strict. When I was in eighth grade, that pastor and I had a very heated disagreement, and ever since that day I’ve had a distrust of religion. Reading about various other crimes committed by people in the name of Christianity made me further question the very concept of it. Now don’t get me wrong – I don’t believe all Christians are bad by any stretch of the imagination. Just like how I was told that the devil “perverts” things and makes them bad, I feel that there are many people out there “perverting” the concept of Christianity. My point with all of this, is that Drummond was the spark that led to my skepticism. While I was at Parkside, I discovered Unitarian Universalism, a faith and belief system that I feel is right for me. Drummond raises questions about life, and I do the same. Drummond stands up for what he felt was the right thing, and that’s a value that I’ve had engrained in me since I was first taught about it by the Power Rangers. 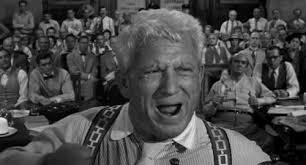 On a much grander scale, Inherit The Wind was the play that led to my interest in theater. By reading it in english class, I went on to get involved with my high school drama club, which led to being a theater major at Parkside, which led to my work at Sunset Playhouse. To this day, being the Stage Manager for Inherit The Wind at Sunset Playhouse is one of my proudest accomplishments. Thanks Drummond, for being an inspiration!